Can You Identify Your Organization's Leadership Culture? Home » Articles » Can You Identify Your Organization’s Leadership Culture? In the pursuit of executing business strategy, culture trumps strategy every time. Leaders must understand the culture and recognize their responsibility in creating — or changing — it. Leadership culture is the self-reinforcing web of beliefs, practices, patterns, and behaviors. It’s the way things are done — the way people interact, make decisions, and influence others. Leaders’ own conscious and unconscious beliefs drive decisions and behaviors, and repeated behaviors become leadership practices. Eventually these practices become the patterns of leadership culture. Dependent leadership cultures operate with the belief that people in authority are responsible for leadership. Independent leadership cultures operate with the belief that leadership emerges out of individual expertise and heroic action. Interdependent leadership cultures operate with the belief that leadership is a collective activity to the benefit of the organization as a whole. How do you know what kind of leadership culture you have — and if you have the culture required for the strategy you set? One way to decode your leadership culture is by assessing how leaders go about creating a shared direction, aligning work processes, and maintaining commitment. 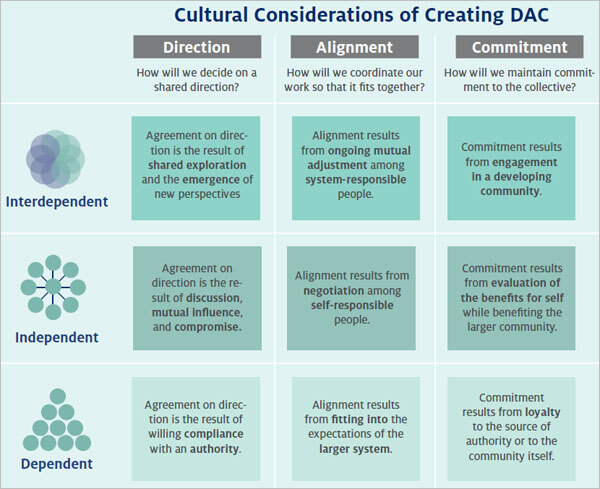 The process of creating direction, alignment, and commitment (DAC) may vary greatly depending on the predominant leadership culture. Looking at the chart below, you can see that the approach to setting direction, for example, could be rooted in compliance (dependent culture), influence (independent culture), or shared exploration (interdependent culture). Similarly, the cultural approach to creating alignment and building commitment will vary. To what extent is the culture having a positive or negative impact on performance? Is our leadership culture helping us to achieve the business strategies we’ve set? If the business strategy and the leadership culture are at odds, leaders need to get serious about changing themselves — so they can change the culture; create direction, alignment and commitment; and, over time, boost performance and meet strategic goals. Learn more about how you can bridge the strategy/performance gap, or how to become a strategic leader.